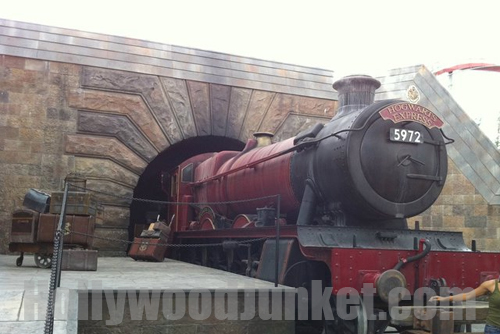 The Wizarding World of Harry Potter: Exclusive Tour! It was a “Celebrity Apprentice” challenge last season – to create a compelling interactive display for “The Wizarding World of Harry Potter” in Orlando, Florida(celebrityapprentice-creepy-castle). On Oct. 11, I had the opportunity to attend a private experience at Universal Studiosâ€™ The Wizarding World of Harry Potter. Iâ€™d been five times previously (what can I say? Iâ€™m a fan armed with an annual pass), but the prospect of not having to elbow my way through Honeydukes sweet shop or make sure I donâ€™t run a kid over on my way to the bathroom was enough to get me stoked out of my mind. Right when you walk into the Wizarding World, a train conductor greets you, with the Hogwarts Express emitting steam in the background. It feels like youâ€™ve just broken through the Kingâ€™s Cross barrier between platforms 9 and 10 and become part of Harryâ€™s world. As a huge (see: insane) fan of the Harry Potter series, it’s impossible for me to accurately describe the feeling you get when you turn around and see the Hogwarts castle towering over the landscape in the distance. Iâ€™m not sure I can honestly say I have ever seen anything more surreal â€“ especially at night, which is when I was fortunate enough to attend. Throughout the area (which is a replica of Hogsmeade, aka the only all-wizarding town in Great Britain), you can experience and buy from shops like the aforementioned Honeydukes, Zonkoâ€™s joke shop, and Ollivanderâ€™s wand shop, where the wand chooses you. Ride the Dragon Challenge, which is a double coaster themed after the TriWizard Tournament, and Flight of the Hippogriff, which is a tamer, kidsâ€™ coaster that takes you through Hagridâ€™s pumpkin patch on Buckbeak the Hippogriffâ€™s back. 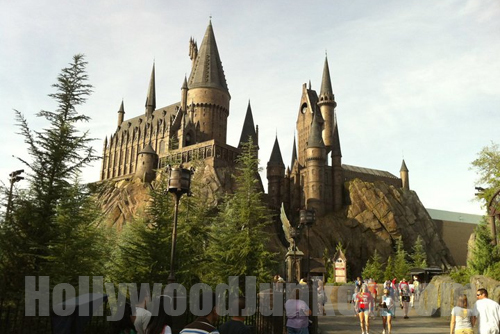 But the crown jewel of Hogsmeade is, without a doubt, Hogwarts castle itself. The queue for the ride inside (Harry Potter and the Forbidden Journey, which is basically what would happen if Universalâ€™s Spider-Man ride and Disneyâ€™s Soarinâ€™ had a baby and themed it Harry Potter. Very fun, though), complete with moving pictures, a Defense Against the Dark Arts classroom, and even Dumbledoreâ€™s office, makes you feel like youâ€™re an actual student attending the school. And to those of us who are still waiting patiently for our 14-years-overdue Hogwarts letter (ahem), that feeling is priceless. If you have never heard the term â€œgeek outâ€ and you are a fan of Harry Potter in any capacity, you will understand it after visiting The Wizarding World of Harry Potter. Donâ€™t miss: Anything! But especially the pumpkin juice and frozen butterbeer.